Hockey centre who became who was picked by the Buffalo Sabres with the second overall pick in the 2014 NHL Draft. 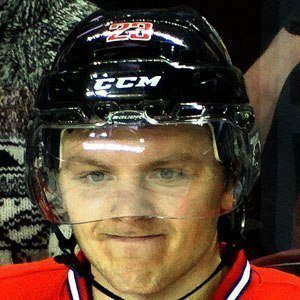 He was previously a star with the Kootenay Ice in the Western Hockey League, winning the Four Broncos Memorial Trophy as the WHL player of the year. He was born in North Vancouver and was the fifteenth overall pick in the 2010 WHL Bantam Draft. He won a gold medal representing Canada at the IHFF World Under-18 Championships in 2013. His father, Paul, and his brother, Max, both played in the NHL. He and Sean O'Donnell were both first-round picks of the Buffalo Sabres.